Twenty seven Lido 14's (15 A's & 12 B's) gathered at ABYC for the annual Turkey Day Regatta, one of the largest regattas in the country with 260 entries! The weather was nice (and challenging) for the weekend's sailing...light and shifty southerly winds on Saturday and a more consistent southwesterly breeze on Sunday. In the Lido 14 A division, Bruce Golison (ABYC) and Becky Nygren sailed for the first time in Bruce's newly acquired Lido 14 #6188 to the win, followed by fellow ABYC member Jerry Thompson and Mandi Smith in second, Mark and Sarah Ryan (both ABYC) and John and Pheobe Staff (Cal YC) in third. It was great to see John's daughter Phoebe (13yo) steering. They were very fast and it's great to see a young junior sailor doing well in our class. The scores and the racing in the A's were tight with numerous position changes throughout the fleet in every race. Bruce and Becky were happy to be racing Lido's and were very happy with the speed of 6188. "We are looking forward to some great Lido sailing and getting better as we learn the boat. We are definitely looking forward to Huntington Lake! ", stated Bruce. In the B Fleet, Mike and Paul Anctil (ABYC) rallied to win the first place Turkey (Turkeys were the trophies!) by winning the final two races on Sunday. Their one point win over the second place Steve Gierke (Cabrillo Beach YC) sailing with Todd Wheatly team made for a very happy Anctil team. Coming in third, was Tracy Conn. It was a great weekend of Lido racing and at this regatta for the trophy winners, the turkeys, pies and bottles of wine made for truly useful trophies. 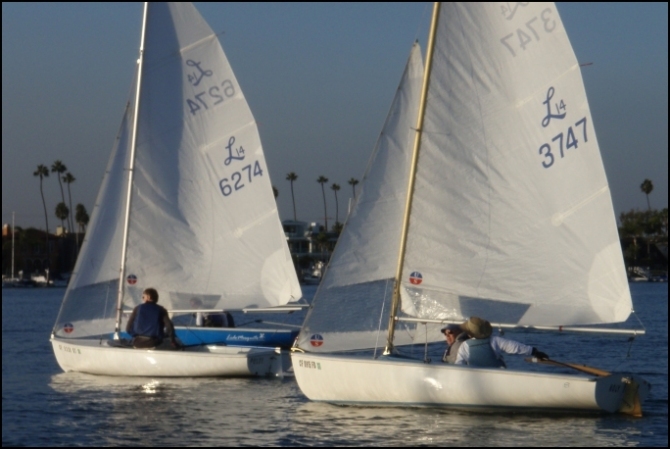 The Alamitos Bay YC Turkey Day Regatta is one of the most popular regattas in Southern California - drawing gazillions of sailors in many different classes. The Lido 14 class shares the bay with lots of Naples Sabots, making for very exciting racing. But don't let that fool you - the racing in the Lido 14 is great! And there's the big T'day dinner Saturday night too! This regatta is well attended by the Lido 14 class - in 2008, 28 boats raced! So check out the Notice of Race, get registered, and bring your appetite!